This glamorous ensemble is fairly easy to find. The most problematic area of the dress is that the glitter is frequently worn thin or completely off the bust area of the dress. Also the red rose is sometimes missing. 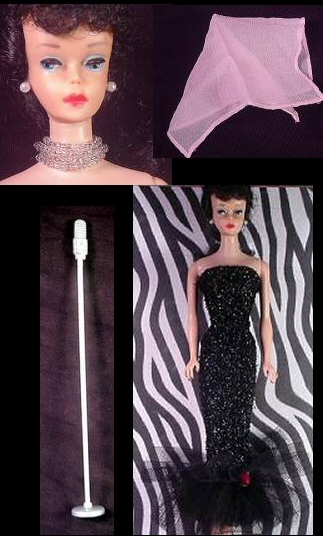 The microphone and stand are actually 3 pieces – the plastic bottom, the metal pole and the plastic microphone. These can be very difficult to find. Mattel released a Solo in the Spotlight Reproduction in 1995, and again in the 2009 50th Anniversary set, Original Teenage Fashion Model.